The GSFA Residential Energy Retrofit Program is designed to give you options when upgrading the energy efficiency of your residential property(ies). Two home performance paths are eligible for financing. You choose the home performance path that best fits your needs and budget. The GSFA Basic Home Upgrade path is a great way to address basic energy efficiency problems in the home. This path is designed to improve the average home's energy efficiency by at least 10%. Eligible efficiency measures are described in the categories below. Your GSFA Participating Contractor will help you choose from a checklist of eligible measures based on a basic evaluation of your home. Click on each topic below to display details. 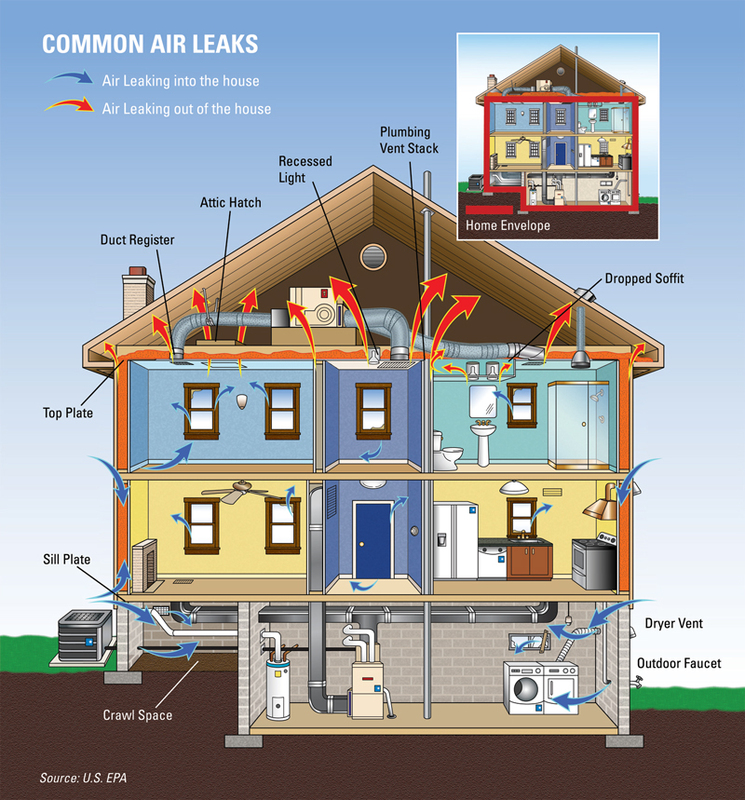 There are many places where air can leak in or out of the home, reducing the home's energy efficiency. Sealing attic air leaks significantly reduces drafts and can help maintain the home at optimum comfort level (keeping warm air from escaping during winter months, cool air from escaping during summer months.) It is one of the most cost-effective measures for saving energy. Insulation doesn't "heat" an area, it simply slows down heat movement through the building materials. Since heat will always move to a colder source, in cold climates insulation slows the heat from leaving the house and in hot climates insulation slows down the hot outside air from entering the cool inside. The result in both climates is energy saved by keeping the air conditioner or the furnace from operating as often. There are many types and forms of insulation, and some are better than others at insulating; however, all work by using dead air spaces or cells to slow heat flow. Air sealing and insulation go hand-in-hand in energy efficiency. Duct systems are responsible for distributing air from an air conditioner or furnace through the home. When a certain point in the duct system is broken or damaged, the airflow capacity is decreased, resulting in higher energy costs. Poor insulation of duct systems can also contribute to energy losses in the home. Replacement of inoperative or inefficient heating and cooling equipment such as gas furnaces, air conditioners, and water heaters can greatly improve energy efficiency. GSFA Basic Home Upgrade path projects must include the replacement of at least one piece of equipment to meet eligibility requirements for financing. The GSFA Advanced Home Upgrade path takes energy efficiency one step further by customizing the energy efficiency project to your specific home's needs. It is a more comprehensive approach to energy efficiency and can result in greater energy savings than the GSFA Basic Home Upgrade path. The GSFA Advanced Home Upgrade path starts with a GSFA Participating Contractor performing a whole-house energy efficiency evaluation using diagnostic testing and computer modeling software to get a real life picture of your home's energy efficiency and identify ways to save the most energy, lower your utility costs, and make your home more comfortable. Up to $50,000 in eligible energy efficiency measures can be financed through the GSFA Advanced Home Upgrade path. All projects must include the replacement of at least one piece of equipment, such as a furnace, air conditioner, water heater, to be eligible for financing through GSFA. Example of a blower door and other testing equipment setup in the home to evaluate the home's energy efficiency. GSFA connects you with home energy professionals trained to evaluate your home and make it as efficient as possible. Contact one of GSFA's Participating Contractors for more info or to get started.